Serious romantic relationships can be challenging enough, but when your significant other is in another city/state/country, the relationship can become challenging in a different kind of way. Whether your significant other is traveling for a week for work, or in the military for several months to a year, long distance can create strains on a relationship. However, the appropriate strategies and tips can help you cope with this long distance, especially when you truly do care about your significant other. Below is a simple guide on how to cope with your long-distance relationship. Communication. Technology these days can really help you feel connected to your significant other, whether you are communicating via FaceTime, Skype, texting, email, or calling. It is also important to set a specific time you would like to talk with your partner. Perhaps even making a “date night” out of it can help you feel closer to your significant other. Be sure to communicate your needs and expectations to your partner. Unmet expectations can create frustrations within the relationship. If you are ever feeling frustrated, be sure to communicate this with him/her, and allow for openness and honesty to help the relationship to grow. Understanding what works best for both of you will create a stronger bond within the relationship. Plan Trips with your Significant Other. Having something exciting to look forward to is a fun way to cope with a long-distance relationship. That could mean you plan a trip to see them, they plan a trip to see you, or perhaps you meet each other in a fun city on each of your bucket lists! Knowing there are X amount of days before you get to see each other again can also create reassurance that there is a set date in mind for spending quality time with each other. Embrace Alone Time. Sure, you certainly miss your significant other, but learning to embrace spending time by yourself is imperative to self- discovery and independence within a relationship. Codependency within the relationship is not healthy for either partner, but having a long-distance relationship can indirectly force you to begin embracing this independence. Finding what you enjoy doing by yourself is a very important way to practice independent self-care, whether it is journaling, watching your favorite shows, cooking, meditating, or exercising. Lean on your Support System. While embracing alone time is important, it is also equally important to be sure to surround yourself with others, especially if too much alone time turns into feelings of loneliness that then start to create sadness. If your partner is away for a longer period of time, leaning on your support system, whether it is your family, friends, or coworkers, can help ease this feeling of loneliness. You also may find out that they too have experienced a long-distance relationship or currently are, so they may be able to provide tips and strategies for you. In addition, spending time with your support system can also briefly take your mind off of missing your significant other. While this list provides a variety of ways to cope with long distance relationships, try to focus on the one(s) that you think will help you the most as you truly know you more than anyone else. Once you identify what works best, try to be consistent with it. 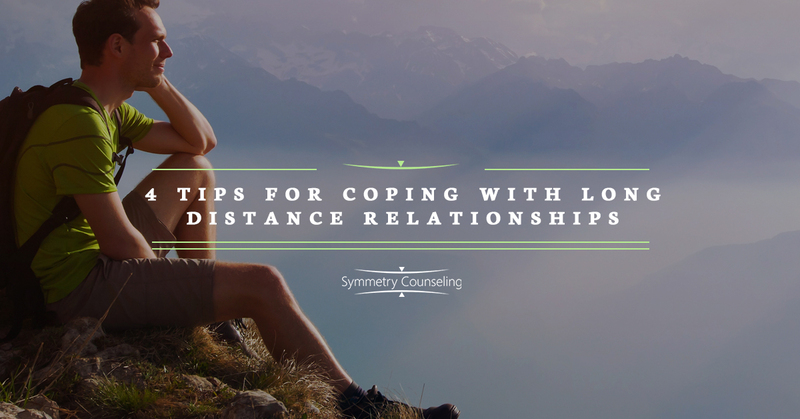 If you are currently struggling with a long-distance relationship, it may be a good idea to connect with one of our skilled counselors at Symmetry Counseling today. You can contact them at 312-578-9990 to set up an appointment.